Monday July 30, 2018 - Devolution Cabinet Secretary, Eugene Wamalwa, has urged Ford Kenya party leader, Moses Wetangula, to walk out of the National Super Alliance (NASA) and join Jubilee Party. 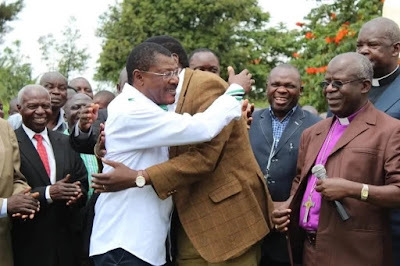 Speaking in Bungoma during the Bukusu Mabanga Declaration on Saturday, Wamalwa told Wetangula to stop hanging on an "abusive relationship". “I have seen how my brother is being abused and threatened and am wondering why he should hold onto such a marriage," Wamalwa said. Wamalwa’s sentiments were echoed by Kimilili MP, Didmus Barasa, who also asked Wetangula to ditch NASA and join Jubilee Party. Barasa said Western Kenya electorate should cut links with NASA leader, Raila Odinga, because he is the one behind the humiliation of Wetangula. “Raila should forget about Western vote because he has no respect to our leader,” Barasa said. “It is the ODM leadership that betrayed NASA’s political course and not Wetangula,” Barasa added. The stupid jaluo baboons, always using and dumping others. They should go back to sudan.